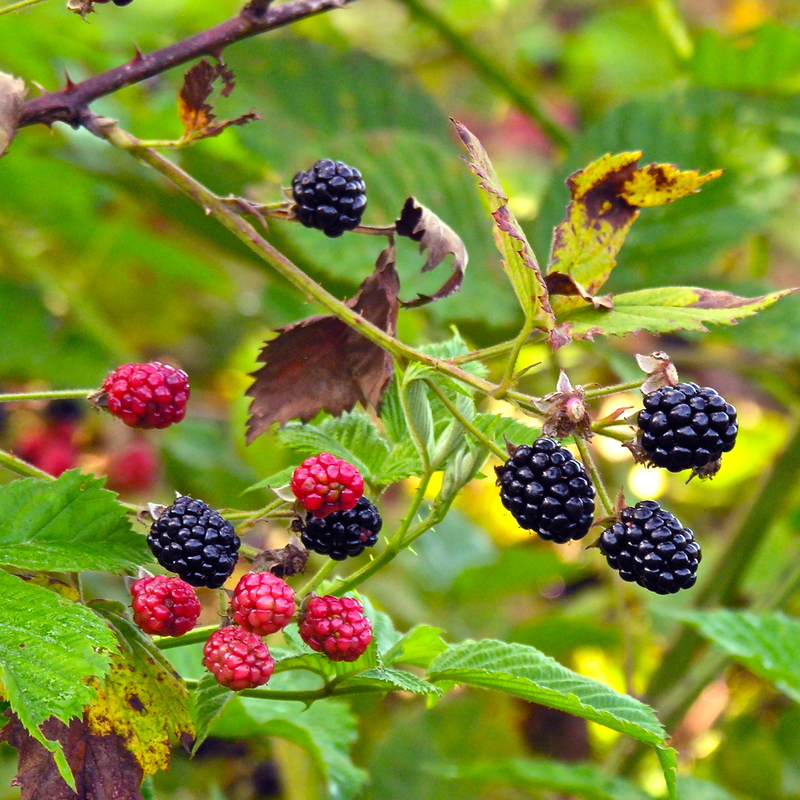 There’s nothing like fresh blackberries in August! 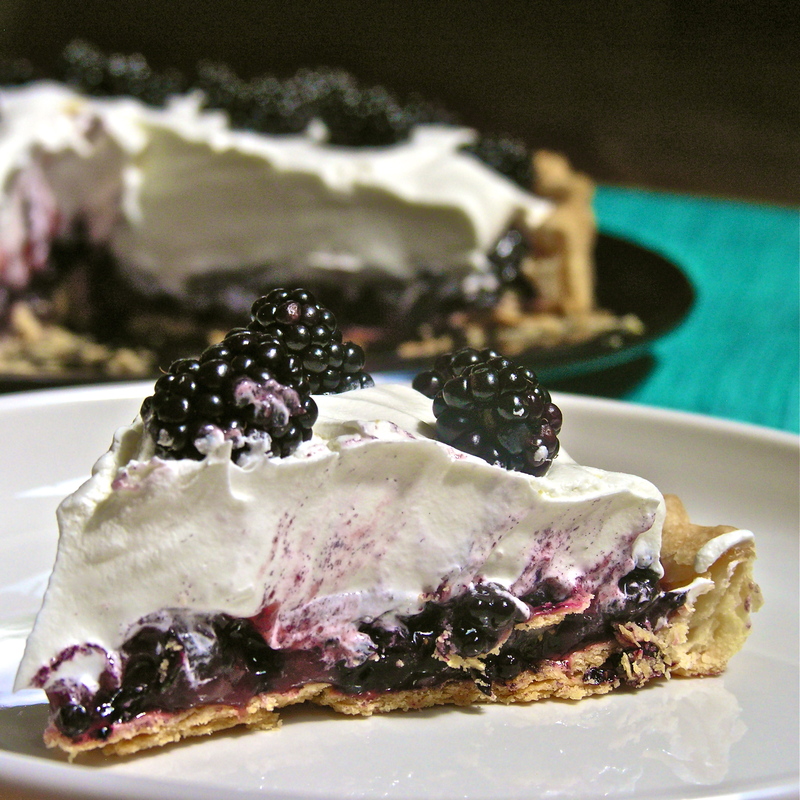 I grew up picking berries in the woods behind our house- 4 cups made a pie. 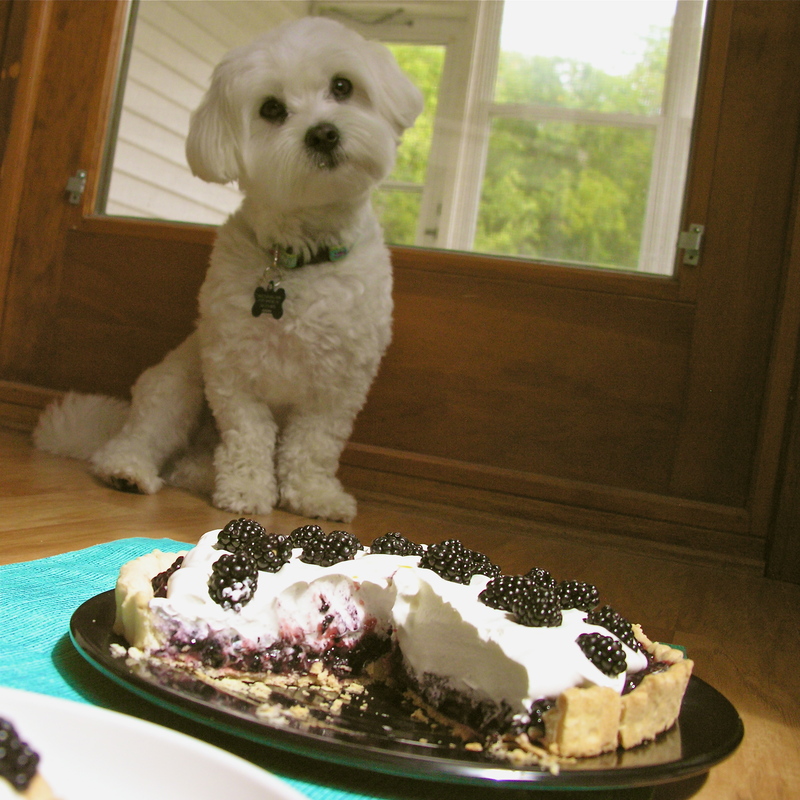 I loved berry picking and HATED the pie (I can’t stand my fruit cooked!) When I was home visiting family a week ago my mom and I went picking and I came home with a big bowl of fresh blackberries. I wanted to see if I could make a fresh (UNCOOKED!) berry pie with them and it turned out wonderfully! YUM!!!! I used a tart pan and had LOTS of filling left over since it was so shallow- I recommend making 2 tarts or a pie with this recipe. Blackberries! (aren’t they beautiful? )- about 4 cups. One small box (3oz.) of Jello- I used Blackberry Fusion- it was amazing- I’m sure Raspberry would work just fine if you can’t find the Blackberry. In a medium saucepan mix together the jello, pudding and water. Cook over medium heat. Cool in refrigerator until slightly set. Spoon pie filling into crust(s) and chill overnight. Before serving, spoon cool whip on top and decorate with fresh berries. YUM!! 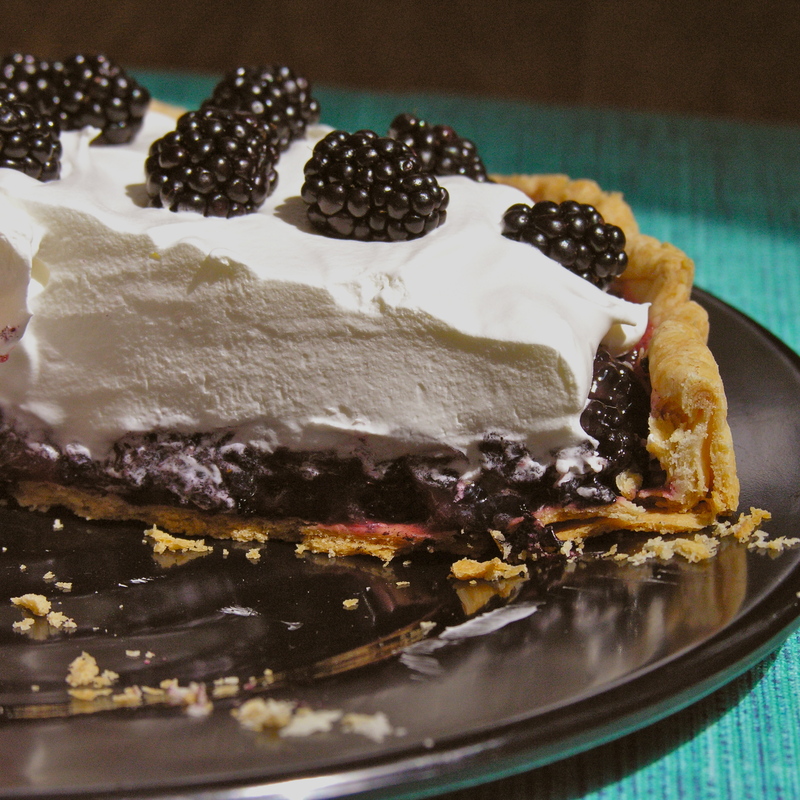 My thoughts: You are going to LOVE this pie 🙂 Our berries were fairly tart and this pie was so sweet and tangy it was perfect! Since I had only prepared one tart crust I had left over filling that I spooned into cups. Just added Cool Whip and granola for a yummy breakfast treat. I love how firm the pie got– no runny cooked fruit here! Posted in Pies and tagged black berry, blackberry pie, blackberry tart, dessert, fresh berry pie, fresh blackberries, fruit pie, pie, sweet, tart. Bookmark the permalink. I.want.to.learn.how.to.take.food.pictures. 😉 You are soooo good at it!!!!! Awww what a cutie! Sorry easily distracted by dogs. The tart looks wonderfully silky, perfect and fruitastic too! Thanks 🙂 Ah! I am so distracted by dogs too! Love em! Nice pics! I love love love your dog… THE cutest thing ever! 🙂 Thanks! I love how foods bring back happy memories! !